JULY 19TH, 2010 – 6:42 pm: I’d just been entertaining a passel of friends for a long weekend of hanging out and reminiscing. Now they were all going home. Made the last airport run of the day and came back to the house, only to find a new visitor had arrived and was stalking a meal out in the back yard. Ran for my camera, by which time he’d moved a couple of yards over. He didn’t much like it when I stepped off the lanai. He proceeded to fluff himself up indignantly and stalk down the bank of the pond (probably muttering, “damned paparazzi!”). OCTOBER 9TH, 2010 – 4:20 PM: I saw him quite a bit throughout the rest of the summer, but had a pretty hard time getting him to show me his best side. It seems he’s extraordinarily reticent (I’m trying to be nice here – I think he might actually be a snob). 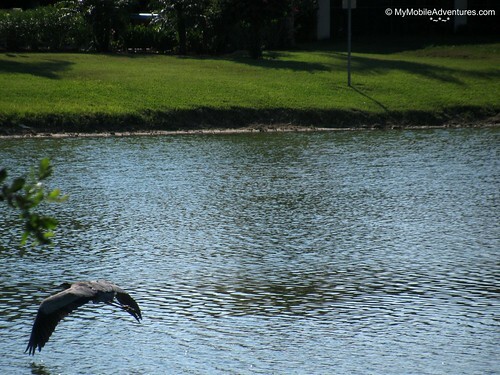 As always, the minute I stepped off the lanai, there he went. 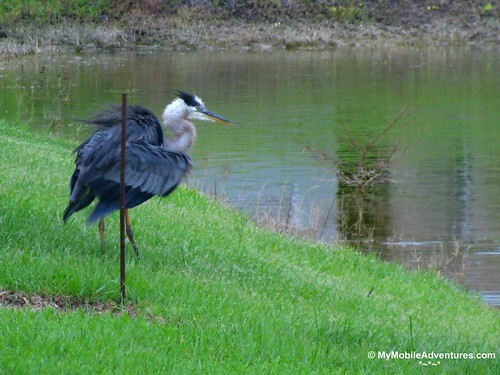 Here’s a shining example of his exit strategy – he just shows me his tail feathers! OCTOBER 10TH, 2010 – 6:27 PM: The back of the house faces precisely west, and the setting sun glaring off the pond can be unbearable – and very warm! This is where plantation shutters come in handy. 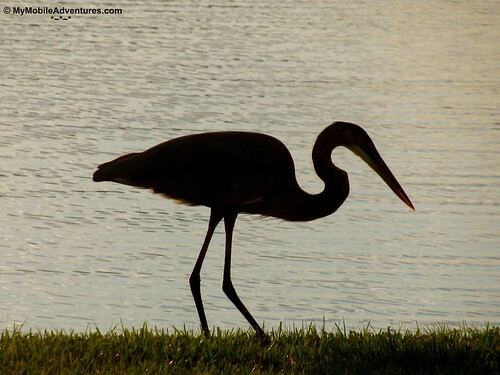 I moved to the French doors to shutter them and when I glanced out, our visitor was poised and still, silhouetted against the water’s glare in the setting sun. Whatcha lookin’ at, Mr. Visitor? “Dinner,” came the reply as he casually speared his. The plump, hapless focus of his attention quivered and then was still. Outstanding shot of the catch. 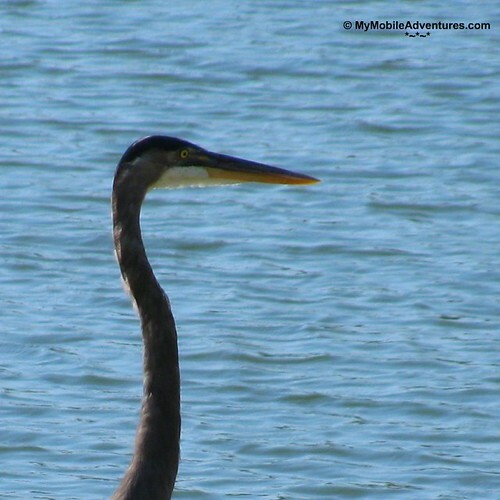 What a magnificent bird to have right in your backyard to watch. Beautiful shots of the GB Heron! 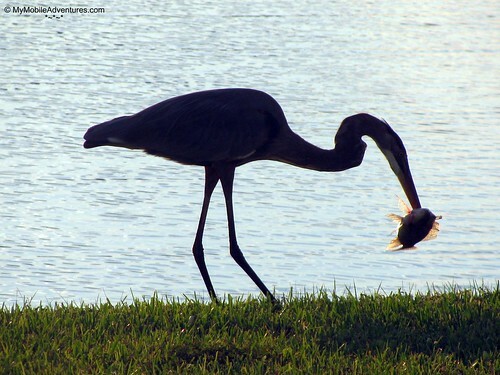 Love the last shot of the heron and its dinner. I could not believe I just HAPPENED to have the camera pointed and focused on him when he did that – I sure lucked out! Wow that is a big fish. 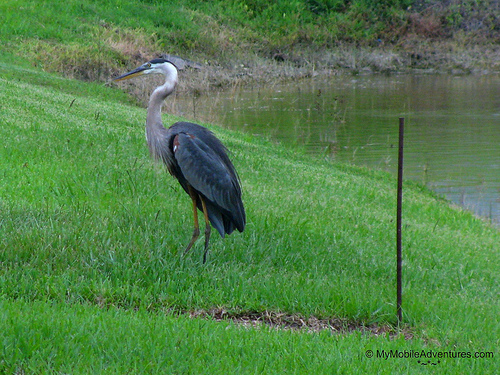 We get blue herons in our yard from time to time. Not often or close enough to see so well, I see them winging their way home some evenings. Think they came for froggies, as we certainly have no fish. Extraordinary! I love your commentary! Your visitor has quite the wing span!